Would Noodler's Black Be Safe To Use In A Parker 51 Vacumatic? I recently acquired a Parker 51 Vacumatic and, up to this point, I've been using Parker Quink Black in it. However, Quink Black is, in my experience, a very dry ink that isn't very water resistant either, so I was curious if I could switch to Noodler's black. I know the ink would require me to flush the pen more often (how frequently? ), but I'm more concerned if it will cause any damage to the filling system, specifically to the rubber diaphragm. Don't think so. Noodler's Black is pH-neutral and not reactive to anything but cellulose (according to Nathan's articles). I have used NB in a lot of pens, from new to old, cheap to expensive. Not had any adverse experiences. I try a lot of inks, always come back to Noodler's -- especially Noodler's Black. Use it in all my Parkers, no problem. The only ink I put in my Parker Sac filled pens, especially the Vacs is Aurora Blue Black, Aurora Blue, Aurora Black, or Visconti Blue. Just my personal preference. There other “Safe” inks for Latex sacs, such as those by Sheaffer, Waterman, Pelikan 4001 series, and Parker. With Cartridge/Converter pens I’m all over the lot depending on the pen and colors. Right now it’s Diamine, Pilot, DeAtramentis, Iroshizuku, Montblanc, Sailor, and Edlestein. I have used Noodler's black in 51 aerometric fillers with no issues. I used it for a couple of years. Now using blue black from other makers. Remember -- 51s were designed to use with Superchrome Ink -- which by all accounts was pretty noxious. Personally I'm not that fond of Noodler's Black (having a slight preference for Noodler's Heart of Darkness). 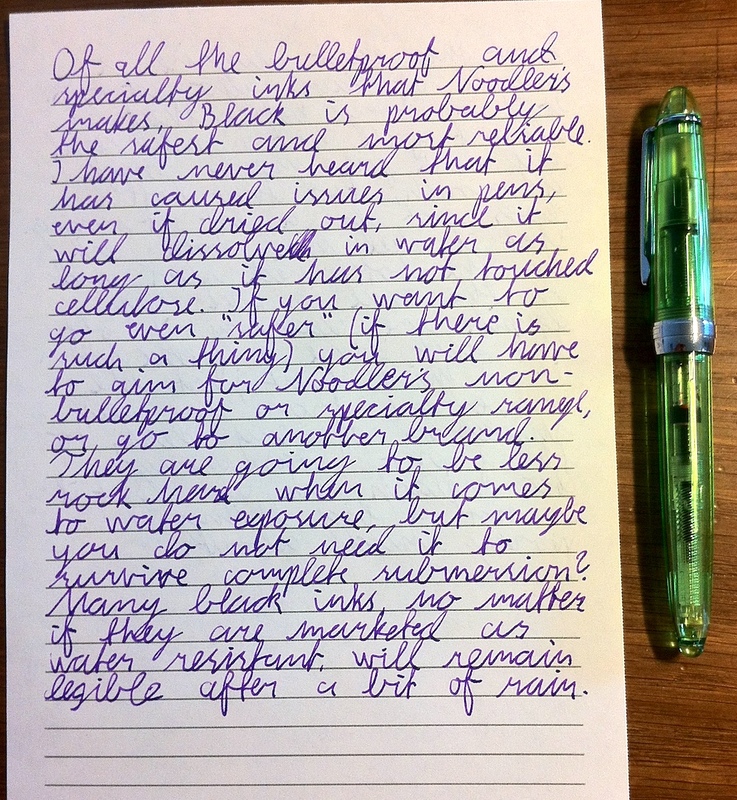 But I've used Noodler's Purple Heart without a moment's hesitation in my Plum Demi Aero. I have a 51 Demi Vac and have had success with Diamine Blue Black and Waterman Serenity Blue in the eight months since I got it. Serenity Blue only one or two fills, but the Diamine Blue Black for a good six to seven months without problems. My 51 Special (aero filler) currently has Levenger Amethyst in it. Edited by Runnin_Ute, 15 September 2018 - 03:07.